The Moon Shiners Snowmobile Club will be participating in Pewaukee’s 4th of July parade on Saturday. The parade is set to begin at 4:00 p.m. starting at the Pewaukee School Districts Parking lot, continuing through the Village of Pewaukee and the lakefront area. Look for us and ask us for membership and trail pass information when we pass by. 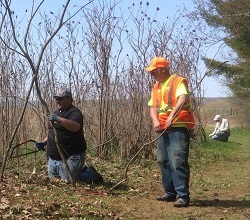 Pewaukee, WI – A group of snowmobilers helped clear brush from some of the trails at Ryan Park this past weekend. The group were members of the Moon Shiners Snowmobile Club of Pewaukee and the brushing they did was a project the Waukesha County Department of Parks & Land Use needed help with. The trail leading from Dori Lou Farms, which also serve as an access point for emergency vehicles, had become overgrown with shrubs and trees. After several hours of work by the club, the trails were cleared not only for emergency access but made the trail more accessible to horseback riders. The Moon Shiners Snowmobile Club helps maintain the only snowmobile trail connecting the Pewaukee Lake area to the Bug Line trail in Sussex. It’s through the efforts of club members and the many landowners who allow trail access which makes this trail possible for all snowmobilers to use each winter. The Moon Shiners Snowmobile Club encourages all snowmobilers to get involved with a Waukesha County Snowmobile Clubs to help maintain existing trails and to promote safe and responsible snowmobile ownership. On Tuesday, November 18 we will be meeting at The Sports Dock on Prospect Avenue in Pewaukee. Meeting will begin at 7:30 p.m. For a complete list of meeting dates view our schedule. The Pewaukee Moon Shiners Snowmobile Club meets the third Tuesday of the month at Hartbrook Lanes. Meetings start at 7:30 p.m.